When non-Japanese dare to include Japanese designer in their projects, they always want something extra to be added - Japaneseness. W Hotel, a boutique hotel brand run by Starwood group, which owns hotels and resorts worldwide, is now under construction. In this district, Kowloon station has been in operation as a connection point between Hong Kong Island and the Airport Since 1998. Besides, expensive condominiums have been built one after another since 2000. However, those buildings were 20 minutes away from commercially thrived Tsim Sha Tsui. Due to the geographic disadvantage, this area looked deserted like the early days of Odaiba. A change brought in this environment was an opening of mega shopping mall called ELEMENTS located right above Kowloon station. In this mall, there are over 200 shops and restaurants including LEI GAREDEN, a long-established Chinese restaurant founded in 1973. Yukio Hashimoto designed this new branch restaurant. At the request by Mr. Hashimoto, Nacasa & Partners was privileged to have an opportunity to photograph the building process of LEI GARDEN. We visited LEI GARDEN whose grand opening was only a short period away. 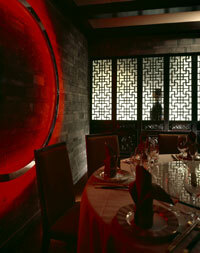 One step into LEI GARDEN took us to the space designed quite differently from the conventional Chinese restaurants. Typically, large restaurants of this kind in Hong Kong have white wall, white ceiling and evenly toned interior decoration. Against this, LEI GARDEN in ELEMENTS has more than one design concepts: spaces reflecting the image of Chinese imperial court themed in white as well as an old house in Shanghai, and also a big room with the paintings of bamboo and landscape on the wall. It was like we were watching a small universe that strongly focuses on cultural sides of China. Mr. Hashimoto explained how he took an approach in his design. "China is in the midst of accepting something new such as high technology or luxury at a rapid pace. While in Hong Kong, you can see unchanged scenery between hightech buildings. 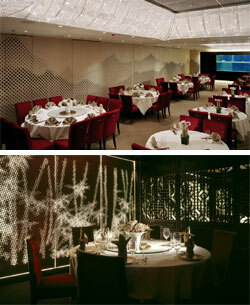 I tried to absorb this kind of dual nature or harmonious coexistence in my design for this restaurant." Regarding the area created in the image of an old house in Shanghai, "I wanted to bring a real old house from Shanghai. I had to give up this idea though." said Mr. Hashimoto. This showed his thorough pursuits of reality. "This big room is almost completed. I think we can shoot this." Nakamichi, our photographer, looked around and mumbled. The commercial complex ELEMENTS was about to open shortly. Even in the middle of the night, many stores still needed crash works to be done. Anyway, believe it or not, LEI GARDEN was far ahead of most stores as for a construction work. In an environment of high decibel, Nakamichi began shooting. Interesting thing was that he paid attention to the angles no customers would ever lay eyes on or get closer. With a camera, he captured the gap between the window frames or the spot on the wall near the light. In the Polaroid, photographs emerged new viewing points that emphasized how beautiful and distinctive this restaurant would be. "Among Mr. Hashimoto's many appealing aspects in his design is creative ingenuity added on the border. That is why I want to take a deeper look on them. I can see two worlds contrasted with each other, or something revealed if the light is off. So, it is a lot more fun on site as I can have a live experience." Mr. Nakamichi stated how he was enjoying this shooting. 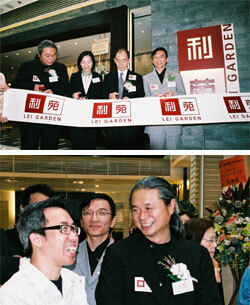 Actually, LEI GARDEN ELEMENTS was the second store Mr. Hashimoto did a design. He started his involvement in LEI GARDEN by working on a branch restaurant opened in 2005 in International Financial Centre in the financial district. The following is Mr. Hashimoto's comments about the fact that Japanese designer dealt with a restaurant from a non-Japanese culture. "People who don't belong to the local culture venture to do a design, and in some cases, can be successful in getting good aspects the culture potentially owns. Japanese culture is based on the history of mixing many different things from foreign cultures. Japan has blended multicultural items from other Asian nations and the West into Japanese culture, and has treated them as if they had been originally from Japan. 'WA' means accepting and harmonizing a variety of items. In this regard, I assume Japanese are good at finding new points of view in terms of design." As the shooting went on, the construction went on as well. Other rooms became completed enough to be photographed. Eventually, we brought a camera in every place needed to be shot. 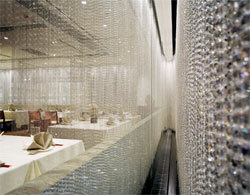 The last photographic subject was an amazing display made of thousands of crystal beads. Water fountaining reflecting beautifully on the beads was creating quite a few forms of impression depending on the angles. 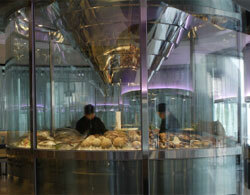 LEI GARDEN is famous as we can enjoy Chinese cuisine beyond culinary bounds of Canton, Shanghai and Beijing. Water display and dishes served showed various faces. It seemed as if multiple impressions had been realized in a single space in consonance with the design of Mr. Hashimoto. Macau consists of three islands: Macau island adjacent to the Chinese continent, Taipa island and Coloane island. They are lined up from north to south just like kanji character, means 'Three'. Macau government decided to landfill 80 hectares of area between Taipa and Coloane to make a new development block, which means two islands were brought together. This area was named Kotai district after two mother islands and the street run through the center is called Kotai strip with aspirations to be, of course, the next Las Vegas strip. At the moment, there is a huge wave of construction for casinos and hotels along the street. In Macau, drastic change came about the gambling industry in 2002. This industry became active in the mid 20th century and Macau Tourism and Amusement Co.,Ltd run by Mr. Stanley Ho had held a monopoly position in the field. However, this Industry finally opened its gate to the foreign capitol such as America or Hong Kong, which as a result, boosted new entry into the hotel and casino business. However Stanley Ho himself as an old-line giant never hesitated to expand his business. He started up CROWN MACAU, a six stars casino-hotel with all the guest quarters larger than 60 meter square, and even an average rate of cheapest rooms is about 60,000 Japanese yen. Four restaurants in the hotel are as fancy and luxurious as guest rooms. 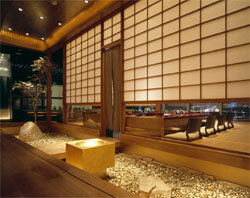 Mr. Hashimoto was in charge of design for two Japanese restaurants, Tenmasa and Kira. Tenmasa is an old brand tempura restaurant established in Ogawa-cho, Tokyo at the beginning of Showa Period (Showa 11th, 1936). Deep-fried tempura is still served in the traditional zashiki parlor style restaurants in Maru building and Haneda airport. Mr. Stanley Ho was so impressed by their meals and service that he approached Tenmasa as to their interest in having a branch in his hotel. Tenmasa decided to open its first overseas branch and unavoidably faced to a difficulty. Regarding designing Tenmasa, they had a different idea from hotel side. Hotel side wanted zashiki rooms combined with a bar space. Against that, Tenmasa's prime desire was to bring their style as it was. Mr. Hashimoto managed to solve this problem as a designer balancing between them. "First priority was how Tenmasa would feel about whole design process. When Japanese top brand with a long history goes abroad, they don't necessarily have to listen to outsider's tepid opinions. Would Louis Vuitton or Prada care about every single word from owner departments? I don't think so. Brand owner has to get what they want, otherwise, brand value will be ruined." 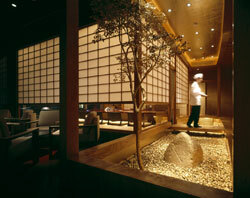 For this already designed restaurant, Mr. Hashimoto allowed his creativity to run in the golden garden. Wood, stone, everything is gold. "Gold means luck and fortune, and feels very Macau, the gambling city. Gold will have a powerful impact on the customers so that they will visually remember Tenmasa as the golden garden. We had an idea that customer can throw coin instead of stone like Trevi Fountain in Italy. If coins are already in there, customers may follow." 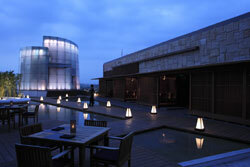 Unlike LEI GARDEN ELEMENTS in the midst of construction, Tenmasa is already open to the customers. Therefore photographing needed to be carried out in the middle of the night. Accepting our request on the spot, store employee joined us and pretended to be an Itamae chef wearing a kappogi apron and a cap for the shooting. Silhouette with a model must depict faithfully how employees for real work during the business hours. At first, a chef entering the kitchen was to be taken but this lacked reality as there were no customers sitting in Zashiki then. So the other way around was chosen. We shot chef coming out of the kitchen to the aisle. Nakamichi asked a question to another attending staff. "Does Itamae chef always work on barefoot?" He noticed a pair of black socks worn by the model and simply got to wonder if that had been the case for Itamae chef as well. The staff said that was the case and Nakamichi continued shooting. The work was completed at 4:30AM. No one noticed they had spent 5 hours until then. Another Japanese restaurant is KIRA run by the hotel. Naming was helped by a play upon word like a word association game. Each floor of CROWN MACAU has a concept. KIRA is located on 10th floor symbolizing the Sun whose mimetic word is 'Kira kira' meaning the Sun shining in Japanese. Two Kanji characters were picked up as they can sound KIRA together, and also, they mean fortune and good respectively. That was how KIRA was born. Bamboo-themed interior decoration was employed as a symbolism of both Japan and China. 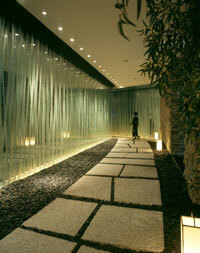 With only one stride inside the restaurant, you will be surrounded by neo-futuristic world of bamboo. Mr. Hashimoto told us what he wanted to express through design for KIRA. "I was trying to think like a foreigner when working on KIRA. They visit Japan for the first time and encounter various interesting things. My design embodies what and how they would remember them, so to speak. Taking foreigner's point of view, you may not find 100% pure Japanese expression in this work, except motif, of course, which came down to the design. Look at the expression of a glass bamboo at the entrance. Or, bamboo basket used unprecedentedly as a screen. I don't think Japanese people would ever come up with these ideas. We exported this kind of interesting aspects of Japan to Macau and added some retouch to meet the design in Macau." In this design, major item is a round shaped kitchen which pops up in front of you on entering a dining space. A lot of fish of the day are crammed on the window of glassed-in kitchen for the display. "Wherever customers come from, they get astonished by this kitchen. They never fail to ask what it is. A little market is my answer." said one of the employees in a smile. Japanese chef took over. "If they can actually see fish, they feel like having fish even without price tag. They order lots of fish out of pure interest so they get an expensive check. We really appreciate it." Hashimoto explained his intention from designer's point of view. "Teppan-yaki grill is about grilling raw food. Before your meals are served on the table, food needs to be delivered from the market and cooked in the kitchen. I just wanted to show this process somehow in live." This may be one of the successful examples of how design can bring a synergy effect on the store operation. Balcony space also adds value to the restaurant. You can see a panoramic view of the area dense with lots of casinos across the river. This space was designed based on the Japanese garden modeling after Irises, fold screen painting by Ogata Korin. "Thanks to the environment, a beautiful night view can be overlooked on the roof, which is a special characteristic of this hotel. Therefore, the garden in the balcony was considered as a borrowed landscape and it was a part of the whole surroundings that further magnifies the world around. I didn't want the garden to stand alone detached from the surroundings, but wanted to have the garden melted in the environment. There must be continuity from the garden to the mountains over the hedge. I gave a careful thought on this." "People in Macau lead a regular life in Macau, which makes this place so unusual to them. Again, I am talking about continuity. I hope this restaurant will give a birth to the new vigorous spirit that can be pivotal for a daily life of Macau in a sense." From 11PM, the shooting did not cease until dawn. At the end, one of the employees proudly confessed that they kept having people who were excited to just take pictures. "We are happy to be recognized in such way as well." The clock said 6AM. After 12 hours, food of the day was going to be ready in the round shaped kitchen. Like any other days, this place would be full of guests who were eager to seek the unusual or to experience Japaneseness interpreted in as many different a way as it can possibly take. My first overseas project was to design a Chinese restaurant settled in GRAND FORMOSA REGENT TAIPEI, a five-star hotel in Taiwan. My relation with foreign clients began without any advance notice. A telephone rang in my office one day. "Can you come to Taipei tomorrow?" I was surprised but responded "I can't get in tomorrow but will do the day after tomorrow." This call triggered a few more opportunities to deal with restaurants in the same hotel. This was how I began to expand my business overseas. No matter where I am, whether within or outside Japan, I respect an atmosphere of the local in the process of design. Even within Japan, No identical designs can be used for two different places such as Tokyo or the local area. In Tokyo, I have to make a shift in approaching two different cities, Ginza and Shinjuku, for instance. Air held in each place is best left for me to be inspired when working on the design. I worked on the properties in Hong Kong and Macau. In Hong Kong, you can see one of the most uniquely sophisticated urban space in the world. Hong Kong had moved through the history differ from Chinese under the British rule. In a sense, Hong Kong is not a pure-blooded breed of China. As we know, Hong Kong has been integrated to China after the reversion, and I think, as a reaction, Hong Kong seems to be seeking common ground of China. Hong Kong has already come to completion as the city. If the new city will be developed in this ever finalized soil, I assume that the key to success is to include an image and message associated with China. In this perspective, it is important to bring out the best from China. For example, it can be a good idea to use some essence of Shanghai, the leading city in China. Having western culture entwined with Chinese culture, Shanghai has nurtured the world of uniqueness. Sophistication comes from both China and Hong Kong would be highly likely to bring synergy effect on the new city to be born in the future. Designer, Hashimoto Yukio Design Studio Co.,LTD. Born in Aichi Prefecture in 1962. Graduated from Aichi Prefectural University of Arts in 1986. After 10 years of experience in Super Potato Co.,Ltd, he established Hashimoto Yukio Design Studio Co.,Ltd. His works include Daidaiya in Ginza, Rantei in Taipei, Kamoka in Ginza 1cho-me, BEAMS HOUSE in Marunouchi. In 2005, the book "The Design World of Hashimoto Yukio" was published by Hong Kong Pace Publishing Limited.